This page will contain text dealing with normal ship operations and procedures and a detailed discussion of starship combat in the ST universe (which also includes a comparative discussion of the various ships, including non-UFP ships). This section provides an estimate of the capabilities of various ships that have appeared in the ST universe. Except for the information provided for the Galaxy class (GCS), most of the information provided here is based upon my observations, deductions, and inferences and has no canonical status. Numbers are rounded for convenience. 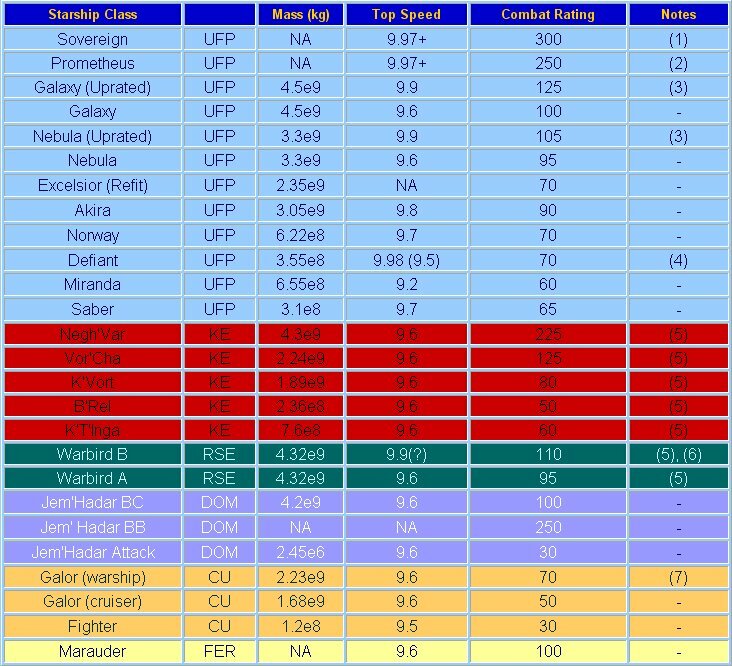 Ship profiles are based upon comparison to GCS capabilities (seeing that the GCS is the only ship class we currently have any meaningful hard data on). Primary determinants of ship capability are size in comparison to a GCS, record of combat of that type of ship (against both GCS and other ships on the list); and passing comments made on the ships in various episodes and canonical references. I have attempted to avoid the use of non-canonical materials beyond what I, myself, have added. I am reasonably certain that, while the ship specifics are not necessarily correct/accurate, the information provided here represents a good comparison between the capabilities of the ships listed. Aficionados or fans of particular ships or types of ship may not like what they see here—but lacking any canonical data or reasoned and well-supported arguments to the contrary (which you may provide if you so desire), these estimates stand. As additional information becomes available, these profiles will be updated. Remember that what you see on the screen is subject to the vagaries of dramatic necessity and is not necessarily a reasoned or accurate portrayal of comparative ship capabilities (meaning that if Defiant needs to destroy a Dominion Destroyer this week for the episode to work out, it will be able to do so, regardless of the actual statistics or capabilities). Sovereign Class Ship (SCS): This is the Enterprise-E.
Torpedo launchers: 5 launchers: saucer ventral (rapid fire quantum torpedo launcher), 2 lower hull ventral forward, 2 lower hull ventral aft. All are available in docked configuration. Photon torpedo launchers can fire up to 12 torpedoes per impulse. Quantum topedo launcher appears capable of launching up to 4 torpedoes in rapid succession. Photon torpedo launcher cycle time is approximately 12 seconds for a full salvo, 10 seconds for 8 torpedo salvo, 5 seconds for 4 torpedo salvo, almost immediate for single torp firings. Cycle time for quantum torpedo launcher is currently unknown. 275+ casings carried, ~25% of which will be probes. Main: PEDR(estimated): 1025 MW (NDF). Maximum: 4.64e6 MW (NDF)for 170 ms. Note: SCS shields utilize multiphasic shield generators, the latest advance in defensive treknology. Cruising: TBD. Maximum sustained cruise: TBD. Maximum: warp 9.975+. Tactical note: Despite its size and mass, a SCS is at least as maneuverable as an ICS in all flight regimes. Galaxy Class Ship (GCS): This is the Enterprise-D. Type X phaser arrays: Saucer dorsal array: 1020 MW; Saucer ventral array: 816 MW; Saucer aft array (p/s) total of 2: 25 MW each; Battlesection dorsal connector array (available only in undocked configuration): 255 MW; Battlesection ventral array: 130MW; Battlesection aft array (p/s, d/v) total of 4: 25 MW each; Nacelle pylon arrays (p/s) total of 2: 50 MW each. With the ship in docked configuration (cruise mode), the phasers may be fired continually for 45 minutes. If the ship is separated, the saucer section arrays are limited to 15 minutes of continuous fire (due to energy limitations). Torpedoes: Upgraded launchers may fire ptorps or qtorps. 3 launchers: battlesection fore and aft, saucer aft (unavailable in cruise mode). Launchers have the capability to fire up to 10 torpedoes in 1 impulse. Launcher cycle time is approximately 12 seconds for each full salvo, 10 seconds for 8 torpedo salvo, 5 seconds for a salvo of 4 or fewer torpedoes, almost immediate for single torp salvos. 275 torpedo casings carried (~25% of these—70—are probes of various types). Main: PEDR: 730 MW (NDF). Maximum Capacity: 3.31e6 MW for 170 ms. Backup: PEDR: 475 MW (NDF). Maximum: 2.15e6 MW for 170 ms.
Cruising: warp 6. Maximum sustained cruise: warp 9.2. Maximum: warp 9.6 (12 hours). Ship can travel at warp 9.9 until auto engine shutdown at t=10 minutes. Additional ships will be added as data becomes available. Data will be updated as appropriate. This chart provides a very basic comparison between most of the known starships. The combat rating for the ships is essentially my estimate of the combat effectiveness of the ship, based upon observed performance, known weapons loadout, sensor capability, general technology, maneuverability, and top speed. It does not take into account special circumstances (such as the ship being crewed by the heroes of the show/movie, which throws everything out the window), specific tactical considerations, or special equipment (such as cloaking devices). This is a general comparison only and is somewhat limited by the general lack of knowledge we have concerning most of these ships. Notes: (1) A very rough estimate, but considering the firepower, maneuverability, and speed improvements over the Galaxy class, this class is at least 3 times as effective. (2) Little real data exists as only one copy of this experimental type is known to exist. Observed performance indicates significant advanatage over Nebula class. (3) These are uprated versions of the original class, with increases to top speed and most likely additional weapons. (4) Design/theoretical speed is warp 9.98, however, deficiencies in design limit speed to warp 9.5 due to power limitations. (5) Thses vessels have or are capable of mounting a cloaking device. Cloaking devices can provide a significant advantage in specific tactical situations, greatly increasing the combat rating of the ship. (6) Essentially a slightly uprated version of the Warbird A, indistinguishable in appearance, possessing a higher top speed. (7) An uprated version of the standard Galor, sometimes referred to as Keldon class. Weapons fit is similar, but crew is larger and vessel has greater persistence and slightly better technology. This section deals with starship versus starship combat while one or both ships are under warp drive. The tactics and limitations discussed here are primarily based upon the capabilities of the Treknology rather than how things appear on the screen in the shows and movies. The necessities of dramatic presentation and the limits of FX budgets dictate that combat (as it appears) bears little or no resemblance to what would actually occur, given the available technology. Actual combat in a ST type universe would be vastly different than hat we have seen. Weapon systems are highly constrained during warp regime operations. Contemporary phaser systems are largely ineffective due to the degrading effects of the firing and target ships' warp fields (the advent of the ACB-jacketed phaser may bring increased effectiveness to phasers in this regime, but until system deployment becomes more widespread and more data is collected, the effectiveness of this approach is unproven). There is an estimated 25% chance of hitting a warp regime target with phasers during a head on engagement, but the probability of such a hit causing meaningful damage is less than 25%. The only truly effective warp regime weapon at this time is the torpedo (either quantum or photon). The stated maximum effective range for the current generation of torpedoes is 4,050,000 km. This range does not take into account the relative velocities of the firing and target ship, the velocity of the firing ship or the geometry of the tactical situation. The chart below lists estimates of the maximum range of torpedoes in the warp regime along the forward (Da), beam (Db) and aft (Df) axes against non-maneuvering targets with a matching velocity (speed and vector). Notes: Delta-V is the overtake speed for a torpedo fired at a target traveling at the same velocity as the firing ship in the direct forward arc. (1) Torpedoes cannot be targeted at vessels on the beam at these velocities due to the short maneuvering time available to the torpedo. Torpedo ranges don't work out to be quite what might be expected in warp combat for a number of reasons. The first reason is that, since we are talking about warp propulsion, standard considerations about velocity and maneuvering are inapplicable. For example: in normal STL combat, the velocity (not just the speed) of the launching ship is a major consideration–torpedoes can be launched up to a maximum velocity of 0.75c, however, if the torpedo is launched in the aft direction, the velocity of the launching ship must be subtracted from the final velocity of the torpedo (since the velocity vectors are 180 degrees out). This does not happen in warp, due to the fact that the torpedo velocity results from the hand-off field from the ship's drive field. Once the torpedo is launched, it is traveling at the launching ship's speed (plus up to an additional 10%) along whatever vector the torpedo is launched along. The short ranges in the forward arc are due to the limitations of active drive time on the torpedo. The drive (and warp field) will only remain active for a certain length of time (depending upon the speed at which the torpedo is traveling). The range listed is that overtake distance which can be covered (given the stated delta-V) at the stated warp factor–the torpedo itself still travels the full 4,050,000 range, but it is overtaking a target which is only slightly slower than itself. The ranges to the beam are essentially a result of decreasing maneuvering time. While it is easy for the torpedo to change directions (in regard to energy expenditure), it still takes time to do so. As the available maneuvering time becomes shorter, the angle off the initial launch angle that can be obtained grows less and less until, at the higher warp factors, engaging targets more than a few degrees of the direct forward and aft axes becomes impossible. In such cases, however, it is generally possible to reduce torpedo velocity to increase available maneuver time. The ranges stated above decrease greatly against maneuvering targets. This is because the torpedo must expend energy in altering course to intercept the target. As a general rule of thumb, the "no-escape" zone (that range at which the target cannot escape from the torpedo through maneuver) for a torpedo fired against a maneuvering target will be (at maximum) about 1/2 of the ranges stated above.